Following on from a YouTube video by Sam Angelo who has the Wyoming Wood Turner channel, I thought it may be helpful to anyone starting out to have my opinions on machinery I have owned or used. As a relative newcomer to the hobby myself, and being on an extremely limited budget, I feel certain others are in the same position starting out and would be glad of the experiences (good and bad) of someone else in the early stages of learning. My first machine came from the Freecycle network. I kid you not. I placed a wanted advert and within a few days I was offered this machine. My Son and I hopped in the car, armed with a few tools and headed out to the location of the very nice lady who made the offer. In all honesty I had no idea what to expect. When I set eyes upon the lathe, a heavenly choir started singing “Hallelujah” inside my head. We partially dismantled the lathe and loaded it in the car, along with several boxes of parts – most of which I did not recognise. Naturally I had no turning tools, so had to make do with wood chisels until I could buy a rather cheap (and as it turned out very nasty) set of basic turning tools. I will give my opinion on those later. The Myford ML8 was classed as a hobby/beginner machine when new. The lathe bed is a steel tube with a cam operated tailstock and banjo. The headstock is fixed and does not move. The motor on this particular machine was ½HP, although I believe some motors were ¾HP. Speed was changeable by altering a belt on 4 pulleys, giving 4 fixed speeds. 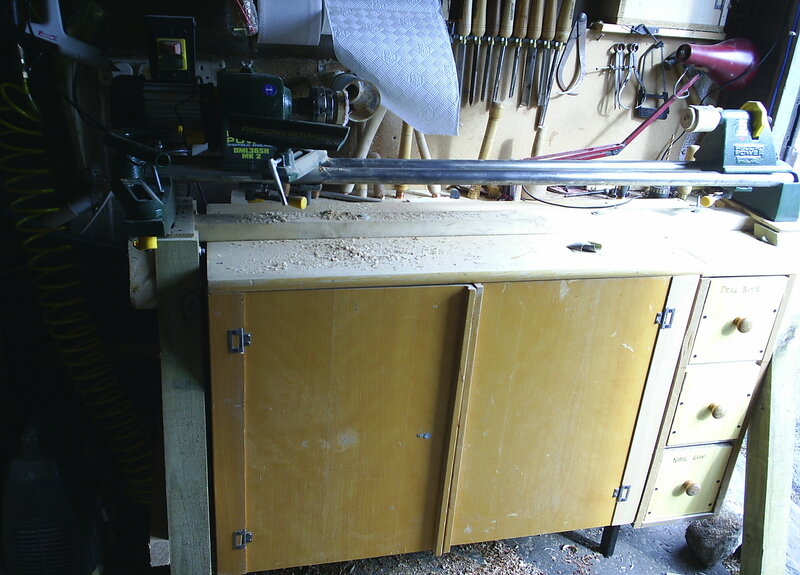 With the motor being slung under the lathe, inside the cabinet in this case, changing speed was quite difficult. I lost a chunk of skin from my thumb one cold day when the motor dropped on it. Both headstock and tailstock shafts are hollow, allowing for easy removal of drive centres, and for drilling holes in lamp standards etc. with a long hole hollowing kit. Headstock and tailstock have No.#1 Morse taper (1MT) making finding accessories easy enough. The inboard thread on the headstock spindle is not a “standard” size making buying a chuck slightly more difficult. The 1″ x 12 t.p.i thread was, I believe, peculiar to the Myford lathes. I was able to source a spindle thread adapter from Charnwood to allow mounting of a standard M33 x 3.5mm chuck. This item no longer seems to be available. There are other retailers out there who can supply these though. The outboard spindle thread size is a 7/8″ x 12 t.p.i left handed thread. This allows mounting timber away from the lathe bed for turning larger items such as bowls or platters. Having snapped a gouge and smashing the tool-rest in this orientation, I gave up trying to use it. The lathe used in this orientation is clearly for the more experienced turner. I would counsel great care if you decide to try turning using this end of the lathe. All in all I was happy with the lathe, apart from a few minor niggles. My main reason for changing to another machine was the limited swing over the bed. Turning vessels over 6″ diameter required a bit of lateral thinking, and changing the speed was a chore. My second machine was purchased used, although very lightly used. The original owner bought the lathe as a complete novice and didn’t get on with the hobby at all. 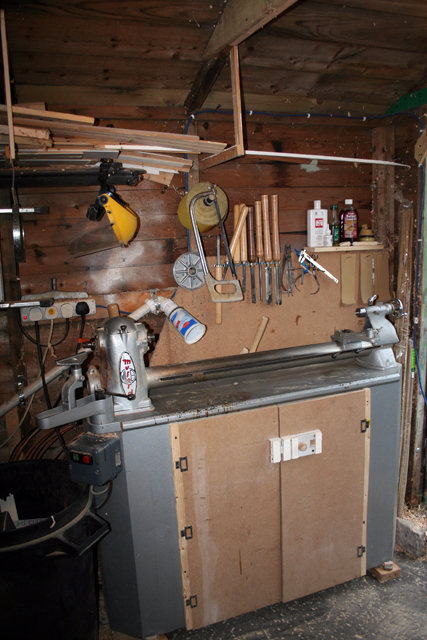 As a result, the lathe sat in his garage unused for several years. I purchased this following recommendations from more experienced turners who advised not to go for the “rebadged chinese import” machines because of poor quality and a tendency to eat drive belts. Almost from the word go I did not really take to the Record lathe. The twin tubular bars have to be set up in a particular orientation, something not in any user guide. This machine has a ⅓HP motor which I found very under-powered compared with the Myford. The tool-rest and banjo needed 2 hands to slide along the parallel bed bars unless the bars were 100% parallel. The swivel-head system has no locking pin to fix the head at 0° or 90° so returning from turning off-board to on-board took such a long time it was very off-putting to turn off-board. The lathe does have a slightly larger swing than the Myford, but if I’m honest, none of the redeeming features. The headstock is not hollow, and requires the fitting of a “thread protector” to facilitate the removal of drive centres. The tailstock is hollow, so the centre can be knocked out, and the long hole boring kit can still be used. The spindle thread is 3/4″ x 16 t.p.i so getting accessories is much easier than for the Myford. Turning off-board requires an optional bowl turning attachment. Again speed was changeable by altering a belt on 4 pulleys, giving 4 fixed speeds. This was much easier than on the Myford because the motor is behind the headstock and is readily accessible. Would I recommend this lathe? To a beginner, yes – if bought as a first lathe. Having moved from a lathe with a solid bed to one which can flex while wood is in motion, it was not for me. 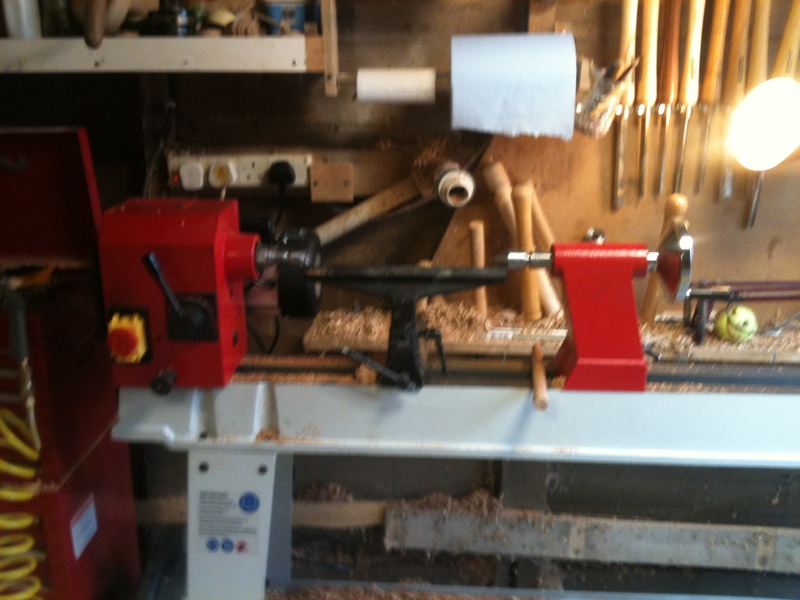 I still have the lathe, and may convert it to a short model dedicated to pen turning. This is my current lathe, and my first brand new machine. I was originally advised to steer clear of this machine, due to poor quality casting and a tendency to eat drive belts. It is produced in the far East, probably China, and imported & re-badged by Axminster. The lathe itself I have no issues with. Axminster as a company however, in particular their customer services and supply chain, are absolutely awful. I will not be purchasing from this company again in future. The AWVSL lathe is classed as a “hobby” lathe. The ¾HP motor seems very powerful and capable, and the variable speed is controlled by a lever which moves in steps and allows 10 fixed speeds. The headstock is able to swivel, and has a locking pin which holds the headstock firmly at crucial angles. Both headstock and tailstock have No.#2 Morse taper (2MT) and both are hollow. This makes ejecting drive centres easy, and allows for hole boring using the long hole boring kit. The lathe bed is cast iron and all 3 components (headstock, tool-rest banjo, and tailstock) easily slide from end to end. Tailstock and banjo are easy to move with one hand, but due to the weight the headstock needs 2 hands. The swing over the bed is an impressive 14½” and the spindle thread is 1″ x 8 t.p.i allowing a massive range of accessories to be purchased. Yes indeed. I paid £5 of my own money for a brand new bench top band saw. The make is “Guild” and is exclusive to Argos apparently. I was sent a gift card for Argos to the value of £75 which cost me nothing. Now, no doubt the tool snobs will have plenty to say regarding quality and cheap import status etc. but from my perspective it is 100% better than the bandsaw I can afford. I have already heard the usual, “you would have been better holding off and spending a few quid extra on a better machine.” The thing is though, I have been waiting to be able to afford a band saw for around 5 years, and never came close. When you have a disposable income of nothing, it is almost impossible to save for what is not 100% vital. So here it is. It is currently perched on my work surface, but will eventually be mounted on a moveable stand so I can wheel it about as necessary. In terms of quality, Yes it could be better. The table is pressed steel, where a cast table would obviously be better. Out of the box it needed quite a bit of adjustment before it could be successfully used to cut. The pulleys are safely locked away behind sturdy steel doors, and have very thin tyres covering them. I may well replace these with bicycle inner tubes at some point. The top pulley needed adjustment because I felt the blade was just too close to the back edge for comfort. The upper blade guide is easily adjusted to open/close the cutting depth, and the NVR switch allows easy starting/stopping of the machine. The blade guide bearing is in a different orientation to what I am used to. This seems counter intuitive, and took a while to understand. In short, it is probably worth the £80 price tag Argos charge, but certainly not much more. I definitely have no issues paying £5 for it, and I have already had more than £5 worth of cuts from it. Time will tell how sturdy it is and how well made the various parts are. The manufacturer gives a 2 year warranty with it. Unfortunately this didn’t cost a fiver. I paid over £200 for this saw, and apparently this was a bargain for the machine. The saw is a Ferm TSM1030. The original blurb claimed the capacity is 70mm thick. I really struggled with anything over 50mm, and even then it was toiling hard. The saw was returned twice under warranty, at my cost, and both times the supplier claimed it was a loose wire. It was not. I checked all of that before I reported the fault. The motor, which I suspect was faulty from day one, has now burned out completely. The stand is also crap. Very flimsy and extremely unstable. It tipped on me when cutting a long board. Not good. Worth the money? Hell no! Complete waste of money, and one for the tool snobs who advised me not to buy the “cheap” table saw from Aldi or Lidl. Straight out of the box I am far more impressed with this machine than with the £225 Ferm saw. The body appears to be some kind of rigid plastic, rather than the flimsy sheetmetal and rivet construction of the Ferm. The stand is stable, the fence is quite nice, and it actually locks in place. It has a laser guide, 2 extension tables, the riving knife is easily detachable for cutting dadoes, and the cutting capacity is about 1″ greater than the Ferm saw. I did a couple of test cuts, and it sliced through 75mm sweet chestnut easily, and made very quick work of an MDF cabinet door. It comes with a 3 year warranty, 2 years more than the Ferm. I need to do a little fettling, squaring up the blade and zero-ing the rip fence, but so far I am much more impressed with this than the so-called better quality saw which was almost 3 times the price. My only gripe so far is, it’s noisy and start-up is a bit urgent. No soft start like I have on my Evolution mitre saw. I’ve got ear defenders, so the extra noise not a huge issue. Time will tell whether this is actually any good, or whether the machine is of poor quality as I have already been told by someone comparing it to their £500 Axminster saw. I don’t have a spare £500 to drop on a machine right now, but need regular access to a table saw. I will report back any shortcomings and/or faults. I will continue to update this page as time allows, and as/when I have more experience of different machines. This is how the lathe came. Harbor Freight probably buy from the same source as Axminster in the UK.